That’s where we’re really trying to understand, either right when things happen or before things happen, what is likely going to occur, and then have the opportunity either to intervene or to modify our process. The in-memory capability allows us to be more of an event-driven organization. What I mean by that is, as things happen and we have that data on the bus, it allows us to repurpose it and use it in a real-time way. We have capabilities of intervening in patient care and doing other types of modeling that both feed back to the researchers, but also help us improve patient care. That, for us, is a very exciting opportunity to really transform the organization and change the way we do business. We haven’t yet looked at telemedicine in a broader sense. Our business requirements just haven’t gotten us to that point yet, but that certainly will be in the mix going forward. Gamble: You mentioned predictive analytics. Is that something that has come to fruition at this point or is it something you’re planning? Yablonka: The analytics space for us is very, very important and we’re making significant capital investments in that area. About two years ago, we updated the IS strategic plan for the organization which was largely informed by the strategic business plan of the organization. In our IS strategic plan, we called out the need for analytics, both what we call analytics of record — which would be your reporting, our ability to profile our business, our clinical performance, our quality, our outcomes, and do all the reporting around the business, and then it talked about our need to be able to do predictive and real-time analytics. That’s where we’re really trying to understand, either right when things happen or before things happen, what is likely going to occur, and then have the opportunity either to intervene or to modify our process so that we can get a better outcome. In that respect, we’re doing some very, very interesting things here using commercial grade tools to do the predictive and real-time stuff. We’ve made investments in both areas. They ultimately both come together. We are wrenching in master data management systems and methods, and that is a very important precursor to a lot of that work, allowing us to really clean up our data and make sure we understand its lineage and its background so we can use it properly. It’s a pretty massive undertaking that will happen in phases over time. When you report data, it’s sometimes okay to have noise in it; when you’re using it for predictive and real time purposes, there’s a certain level of reliability you need in the data, forcing you to have some discipline around the data management piece. So we’re very excited about that and we moved forward on that. We’ve also laid in some technology which we’ve had about six or seven years’ experience with have recently replaced, and this is around enterprise service bus. Our data highway, if you will, is really a commercial grade view of this whole thing. It’s not enough just to be able to interface systems and send data from system A to system B. It’s important for us to actually have the data sit on the highway. In our new system, that data sits in memory, so it’s very, very quick. And when we need to repurpose that data for any reason, whether it’s sending it to another system or being able to analyze that data for analytics, predictive, real time, we have that capability now. I think if you went into the commercial space, commercial industries, they’d probably say ‘that’s very interesting. 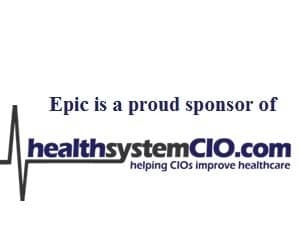 We’ve been doing that for a long time.’ It’s a newer technique in healthcare and the in-memory capability allows us to be more of an event-driven organization. What I mean by that is, as things happen and we have that data on the bus — and that data could be clinical data, financial data, data from medical devices, whatever — it allows us to repurpose it and use it in a real-time way. We’ve also brought on another product to go with that called a complex event processor, and that’s the very fancy rules engine. Here’s where we get to work with some of our researchers on some predictive models around clinical outcomes; our researchers and brilliant faculty will develop the algorithms, and then we’ll code that into the complex event process (CEP) with the data running on the bus. We have capabilities of intervening in patient care and doing other types of modeling that both feed back to the researchers, but also help us improve patient care. That, for us, is a very exciting opportunity to really transform the organization and change the way we do business. Gamble: That is really fascinating. Will it be possible for some of these modes to be — I don’t want to say duplicated, but used by other organizations? Is that something you could see happening? Yablonka: With some of the modeling, we’re just getting going. We’re moving it along. Some of the models, you could argue, will be open source, whether they’re best practice-based flows or they come out of industry algorithms. Some might be proprietary and intellectual property of our organization and could be commercialized. No matter what they are, if they’re to be used for patient care then, obviously they’re very important to our clinicians, and we take a lot of time to make sure we work closely, whether it’s our physicians, our nurses or other health professionals, that these things really do benefit our patients. Gamble: As far as some of the other things you’re doing, what about telemedicine — anything going on in that regard? Yablonka: Yes. As part of our organization, we have a group called the Urban Health Initiative (UHI) which really works on the south side of Chicago along many, many fronts; working on everything from disparities in healthcare to coordinating care on the south side, to thinking of new ways to provide services to our population. The UHI is a vehicle that has used telemedicine but in an urban environment to facilitate care process. We haven’t yet looked at telemedicine in a broader sense. Our business requirements just haven’t gotten us to that point yet, but that certainly will be in the mix going forward. Gamble: How are you positioned for Meaningful Use? Yablonka: Meaningful Use has been a challenge like it has been for everybody else. MU 1 we’ve done just fine with; we worked very hard to make sure our attestation went well, both for the hospital and for our physician practices. So MU 1, year 1 and year 2 we did well with. We’re just attesting now to MU 2. We’re hoping it’ll go well. We think we’re going to be okay with that, but it’s been a big lift for the organization. Gamble: What do you think was the most challenging aspect of it? Yablonka: It’s hard to say. There’s a lot to it. Probably interoperability with other organizations; that’s a bit of a challenge in a very fragmented marketplace where public exchanges/HIEs have been limited so far in the state. We do a lot of business in Indiana, so that makes it a little bit challenging, but we’ve worked our way through that. I think for us that’s been a challenge to work through but we think we’re there. Gamble: Are you participating in an HIE at this point? Yablonka: There are two in Illinois that are important to us, and we’ve spent a lot of time with both of them. We haven’t up until this point only because our business or use cases haven’t been there. They are coming very quickly. Particularly as, in the state, Medicaid goes to Managed Care, there will likely be a backbone around that with the Illinois state HIE. I’m sure we’ll join and work with them. Then there’s another one in the Chicagoland area, and we’re working with them and watching them closely to see how they interact with the state HIE, and how that will all shake out and what the business model will look like. And then being an Epic shop, obviously, we can already trade with other Epic-based organizations, and that’s been up and running. We’re doing that work already but just more of on a private side. Gamble: As far as ACO, any involvement or any plans there? Yablonka: Our organization is talking about our future business strategies. Our organization is a little unique; as an academic and tertiary or quaternary care provider, we deal with really complex care. Primary care is not our biggest practice. Most of ACO configurations require a very large primary care environment, so we’ll see how that goes. We certainly are watching the environment in Chicago with the emergence of ACO-type organizations. Whether or not that’s the exact model we’ll go with is to be determined.